When my father would talk about his mother, Josephine, he would inevitably say something like “But that wasn’t really her name”. Her name was Johanna, the same as her cousin Johanna Durney who was a few years older and lived in Queens. According to the story my father told, the two girls were at the zoo, saw a monkey named Johanna, and promptly changed their names to Josephine. I always wondered about that monkey, but how could I ever prove the story? There must have been hundreds of monkeys at the zoo and which zoo – Central Park or Bronx? Last year, through the magic of the internet, I was able to find my Durney cousins. It turns out their Great Aunt Josephine, who was called Josie, lived a long life and they knew her well. They had also heard the story of the name change, with one slight, but significant difference: it wasn’t a monkey, it was a gorilla. Gorillas are a bigger than monkeys, in more ways than one – they’re much bigger news. I went straight to the internet and sure enough Johanna the gorilla was big news in 1894 when my grandmother was 7 and her cousin 11. She was part of Barnum and Bailey’s circus and spent the summers touring and the winters in Central Park Zoo. She arrived in December 1893 to great fanfare. Every newspaper carried a story, often illustrated, with descriptions of what Johanna ate, her temper, her appearance, and her “husband”, Chiko. She was the star of the day. Those two little girls must have been mortified to have the same name as the gorilla in the zoo, no wonder they changed their names. Last week I posted a link to Forgotten New York’s Manhattanville webpage. I thought I would point out some Ryan-Colbert connections on that page. As my niece Kate said in her comment, we took a grand tour of Manhattanville – twice. The second time my son, Joe, came along. I was surprised at how many of the old buildings were still around. My father grew up in Manhattanville and a few years before he died, my niece Becky videotaped him telling the stories of his childhood (and he could tell a story). They proved very helpful on our tour. If you scroll down the Manhattanville link, you will see two yellow sigsn – Manhattan Street and Lawrence Street. Those are the old names for West 125th and West 126th Street and still in use when my father lived there. The Ryans lived at 11 Manhattan Street at one time and later lived at 88 and 112 Lawrence Street; 88 still stands, but 112 was torn down years ago and is now the site of the police station. 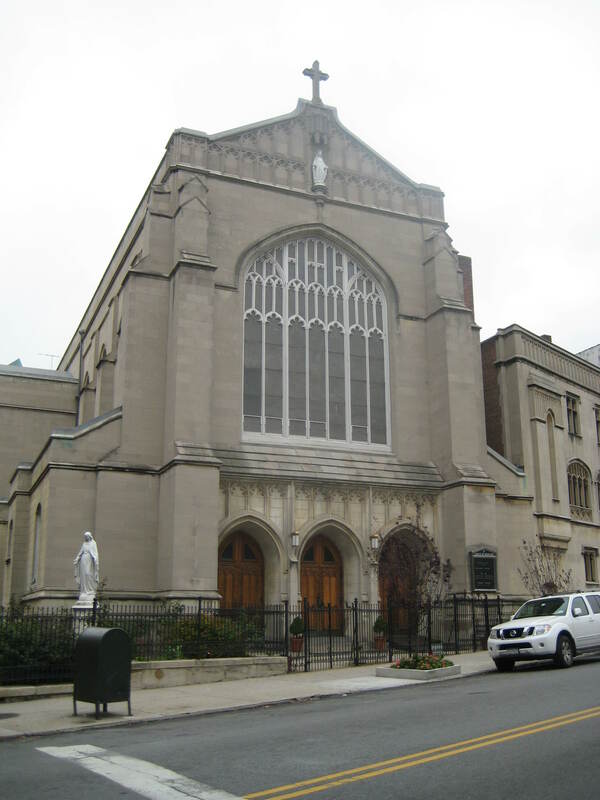 Scroll down further until you see the picture of St. Joseph’s Church – Great Aunts Maggie and Addie were married here. 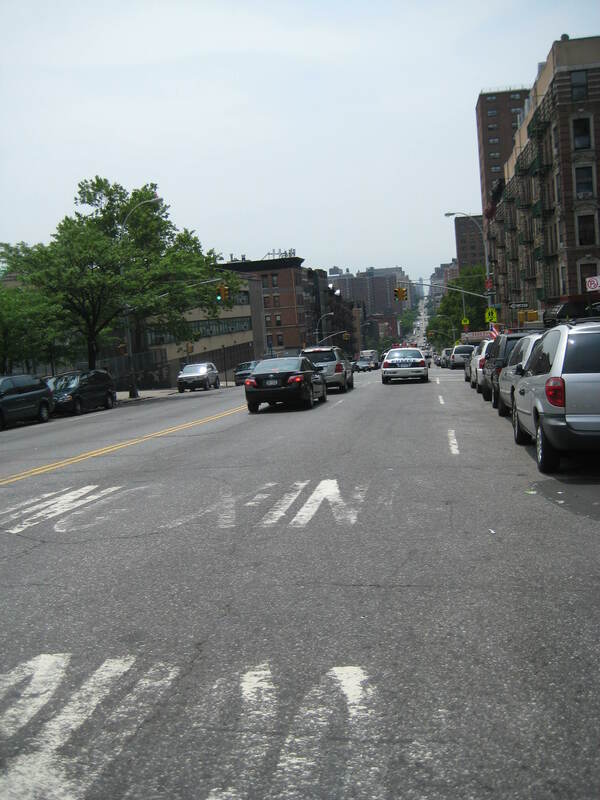 There’s also a picture of West 126th Street – Manhattanville was in a valley and a separate village. Even today you know you’re in a different section of New York because Manhattan and Lawrence Streets are at an angle – they cut right across the standard New York grid. 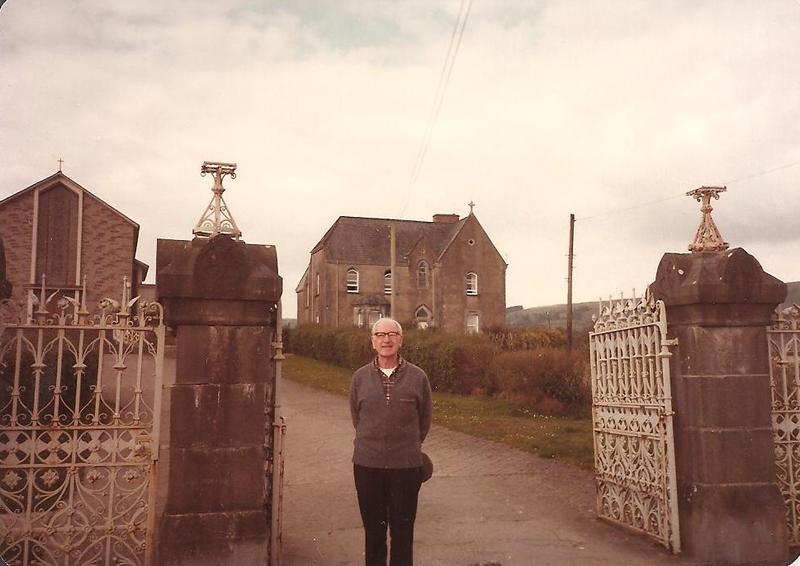 The Speyer School was a few doors down from my father’s house and St. Mary’s – directly across the street – looks much the same as it did, except the old orphanage that so fascinated my father and his brother Joe is gone. Now there’s just a sign that says “Sheltering Arms Playground”, but in the 1920s the orphans played there and Larry and Joe would watch them and even climb the wall to play with them – until the orphanage built a high brick wall to keep out the neighborhood kids. Next is a sign for Old Broadway – this was a short stretch of the old Bloomingdale Road that was kept when the road was widened and named Broadway. My father was born at 85 which is long gone. Today, at the end of West 126th you will see a block of Old Broadway to the left – and a short stretch to the right leading to the housing complex. Old Broadway picks up again for a couple of blocks at the other side of the housing. You’ll have to scroll down quite a bit to get to the next Colbert connection – a rather shabby three story house on West 131st Street with what appears to be the remnants of a fuel sign. Mary Colbert Grossman, my grandfather’s aunt, purchased this house in 1890. 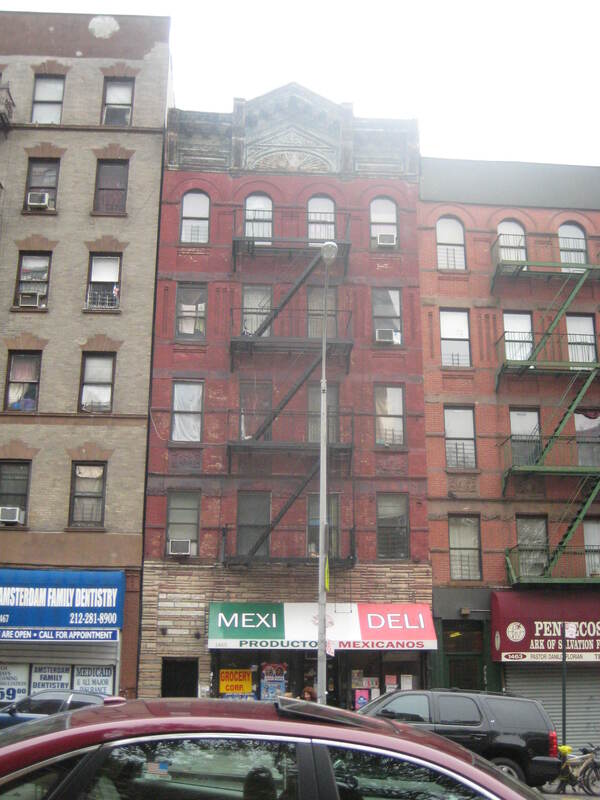 Two years later, she purchased several more lots – she (not her husband) owned 614-622 West 131st Street. Her husband, George, had a trucking business which was housed in the stables at 614-618. These buildings will all be torn down for the Columbia University expansion. Manhattanville is in a valley; my father always remarked on the trolleys going up these steep hills. I’ve been working on the Ryan section of the book for the past couple of weeks. I have a bit of a to do list for the next time I go to the Municipal Archives. Now I’m trying to review and rewrite the narrative section of the book – the stories of Michael Roche and Mary Wallace and Lawrence Ryan and Johanna Roche. I hadn’t looked at my draft in a long time and it seems that the Roche-Wallace story is in pretty good shape, but the Ryan-Roche story – ugh – it’s really bad. I just wrote down some basic facts, I guess I was planning to do more and then just stopped. Fortunately, I have a lot of material around and am reviewing all of it. The Ryans moved to Manhattanville around 1890. It’s been interesting reading up on the changes in Manhattanvile during the period they lived there. Looking at the maps of the area, I can see how close they lived to schools, churches, and each other. The Colberts also lived in Manhattanville – they moved there about the same time as the Ryans, so research for the Ryan section does double duty. I want to check out the addresses and see how close they were to each other. They would both have gone to Annunciation Church, and maybe even to the same schools. Josephine Ryan was a bit older than William Colbert, so they wouldn’t have been in the same class. 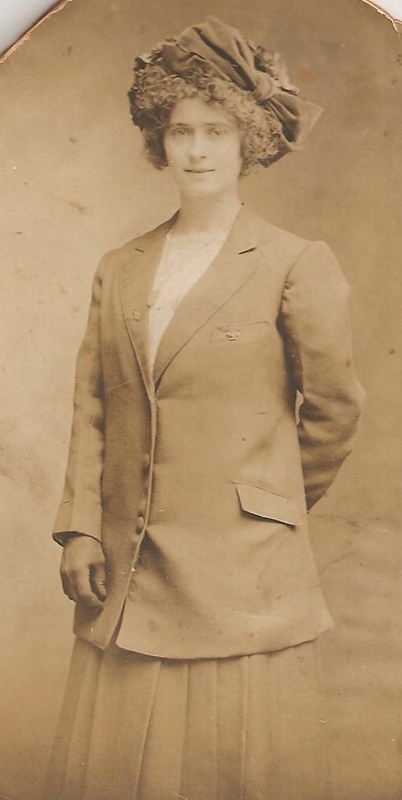 Her sister Helen was the same age as his brother James; her brother Larry the same age as his sister May – so maybe they went to school together?? Who knows. Church of the Annunciation - the new church built in 1907 - the old church was two blocks west. This week I didn’t get too far on the book or the background research. I was busy preparing for the class on Immigration and Naturalization that I will be teaching for the Dutchess County Genealogical Society in about a week. It’s been interesting preparing and I did get to review a lot of my records. After reviewing the passenger list again, I am pretty certain I found the ship on which Johanna Ryan and her 3 children arrived, with her mother. It’s not an exact match – that happens so often in genealogy. You would think it would be easy to find a woman traveling with three young children, but no, the names of two of the children are wrong, but their ages are right. Instead of Margaret, Michael, and Mary, it’s Mary, Michael, and Pat. Oh well. 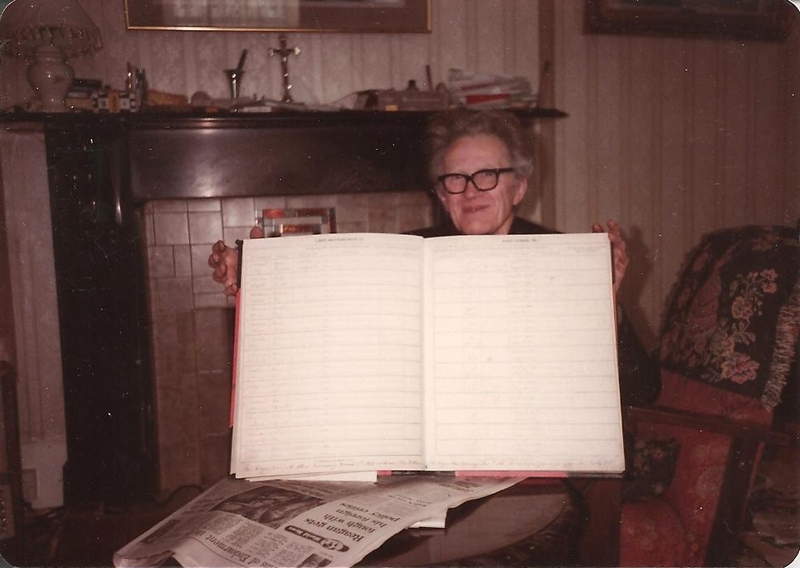 I did get some more information on Aunt Addie’s family, but I’m still missing details of 7 of her children – she had 13. I’m still trying to figure out how to set up this blog, I keep trying new themes.